The only personal and direct comparison I have to living on the margins with people on the street is the Waiters Union experience as I have mentioned in a previous post. 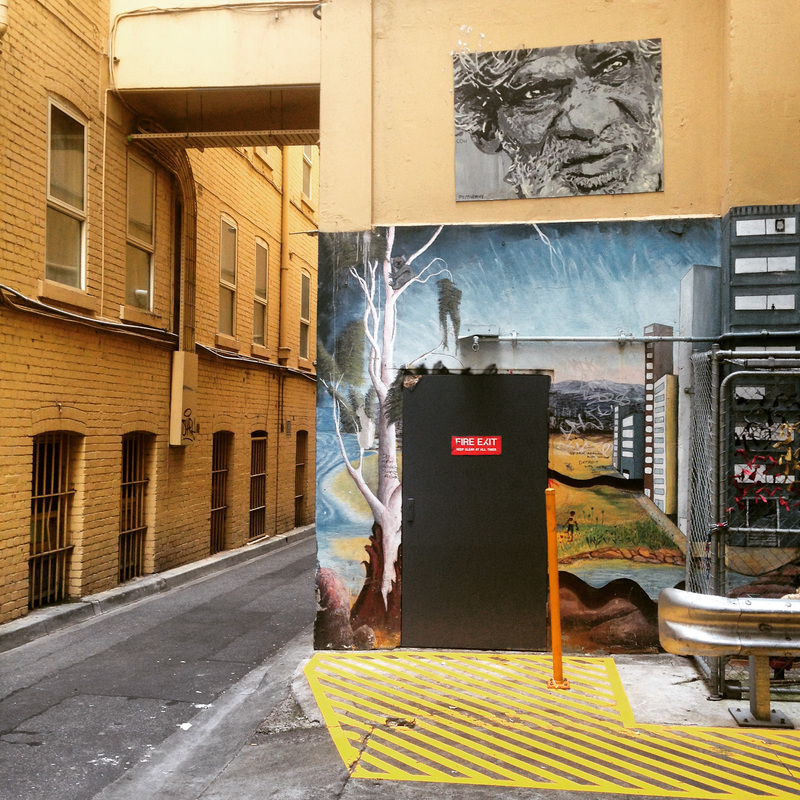 In that experience, members of that community rubbed up against the mentally ill, homeless and other people cast aside by society and worked in that space by sharing meals, starting complimentary businesses and projects, doing creative work and finding ways to walk alongside them and meeting them where they are at. 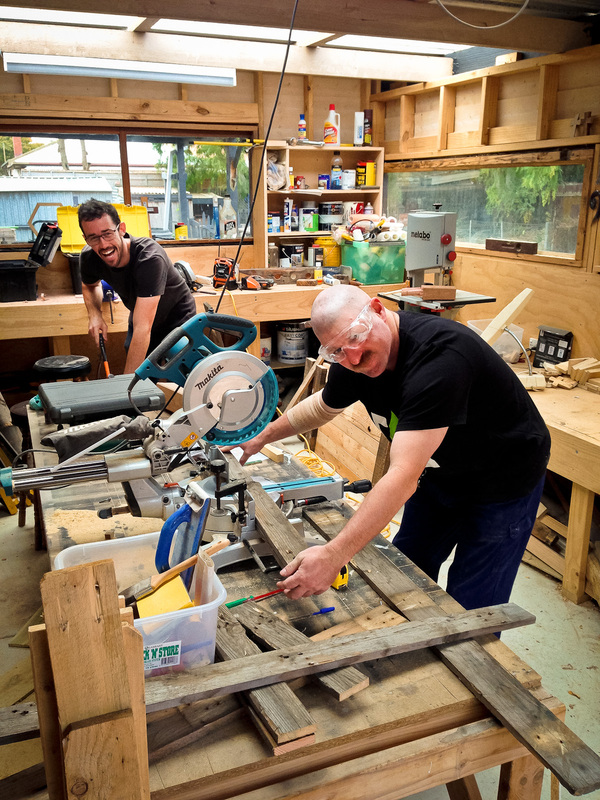 Not surprisingly, the crew at Urban Seed in Melbourne’s CBD are doing many of the same activities. Always surprisingly though is just how much generosity, grace, humbleness and genuine hospitality is apparent through all its members, especially (with no condescension intended) given they are such a young group. Heidi originally heard about Urban Seed about 15 years ago while my prior knowledge of them was counted in days. Despite celebrating 20 years of service this year, many people that we have spoken to within the city and even ones providing similar services have not heard of them. This low-profile is likely a deliberate approach: it’s not about being flashy (and there’s no budget for that anyway) but simply doing life at the ground level (or even the basement 😉 ) with those in need, particularly the homeless, the damaged and the unwanted members of society. They have a residential internship community consisting mostly of a small volunteer corps who are dedicated to “practising the discipline of hospitality, by inviting others into the home they had built in the church.” Urban Seed says that “everyone needs a place to belong” but with a high staff turnover rate where pretty much no one exists from most of the past 20 years, it is easy to see that offering hospitality and a sense of belonging to those on the margins is not a task for the feint of heart. One colourful character named Woodsy has been here for 15 years and would have been around during the “heroin years” as several people have called it, when ODing became a regular occurrence. 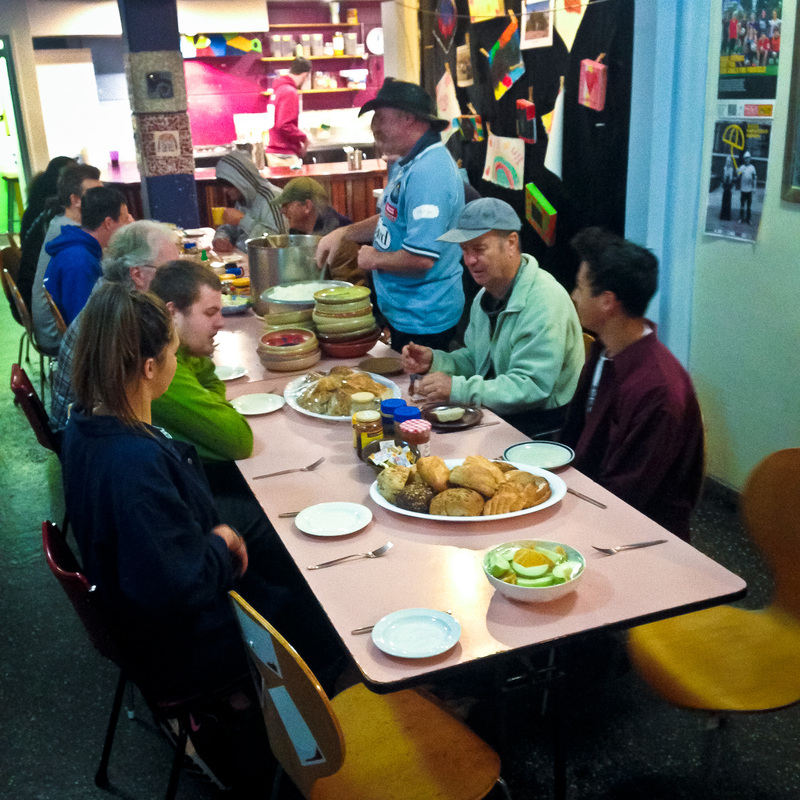 We first came across Woodsy the moment we entered the Credo Cafe space (which is entered off of Baptist Lane at the back of Collins Street Baptist church) as he was running lunch prep for Tuesday’s weekly “free lunch”. This is how Heidi and I were introduced to the group of random plus live-in volunteers who keep Urban Seed’s numerous programs running day after day. 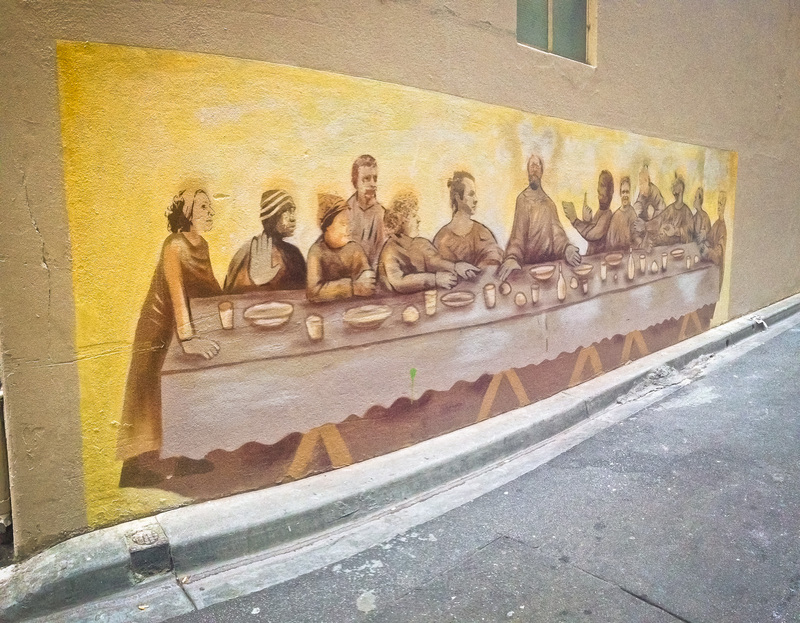 Having been provided with a loose schedule of regular activities with which to attend and essentially shadow the live-ins here, first up for us was helping with Credo’s well-known lunch; it isn’t quite a soup kitchen but certainly provides much-needed meals to folks doing it hard on the streets of Melbourne’s CBD. It was a great introduction to Credo on a number of levels: we got to see the relaxed and friendly nature of the volunteers as they both did their usual chores but also how we were seamlessly brought into the fold; we immediately met the regular Credo diners and spent time hearing their stories; and we enjoyed a generous free meal (Indian curry, grainy bread, drinks and dessert) with leftovers being offered to any of the 30 guests who wanted to take away a container with them. On our busy first day, we went from the Cafe to an informative meeting with Stephen Said, Urban Seed’s friendly Engagement Manager who answered a lot of our general questions. It reminded us further of how tight this relational work community is as both Heidi and Stephen had a lot of overlapping work and personal contacts despite never meeting each other before. An administrative meeting followed that which allowed us to glean some interesting info about the inner workings of the Credo team and the challenges they face with things like homeless folks getting territorial when overstaying their welcome in the Credo “backyard” (the lane behind the church) plus financial concerns, scheduling and other mechanics of living in community. As with our other stops on this trip so far, there is a lot to absorb and it while we have been gobbling up all this valuable material that our hosts have graciously been providing, it makes for a tired little brain. Luckily there was some available space in one of the apartments of the church office/residence tower for us to crash as some residents were away that week. Our room on the 7th floor was decked out with a PS3 and weight-lifting equipment which initially belied my vision that it would be more monastic given the Christ-centred nature of our hosts. A bit 18th century thinking on my behalf perhaps though I was surprised to see some first-person-shooter games on hand! I guess everyone needs some way to release tensions in this challenging environment! The rest of our spacious apartment housed Rachel and Scott who were oft absent due to study/work and illness, but our neighbors, Tim and Beth, on the 9th floor were quick to invite us up for dinner the first night. Throughout this trip I have been continually impressed by the hospitable nature of our hosts, and Credo’s group were no different. But it is not just hospitality at work here: it is genuine, open and non-judgemental conversation with good listeners. On top of that, Tim and Beth (plus Jono and Michael the following night) were 20 years my junior yet embodied a mature presence and impressive capability for patient, honest and welcoming companionship. It would be easy to be workmates or friends with people who are so used to thoughtfully engaging with any and everyone. I felt like I could learn a lot from folks like these. 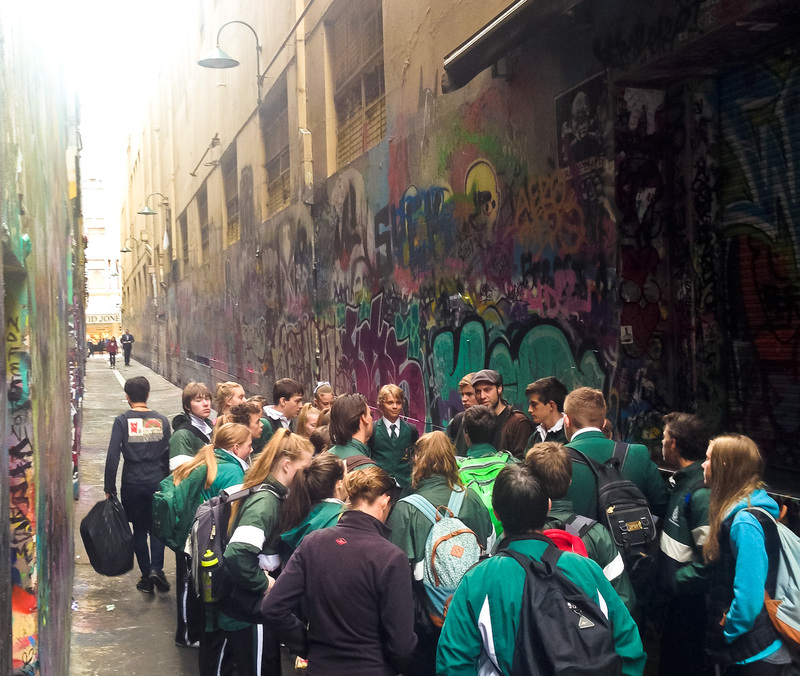 Other highlights from our short visit were: a walk around the area streets with some year 9 students, a writing class with local folks of all backgrounds and a men’s shed morning. The first was a suggestion by Stephen; he thought we’d enjoy the awareness-raising educational walk that Evan – a non-resident Urban Seeder – does with year 9’s. 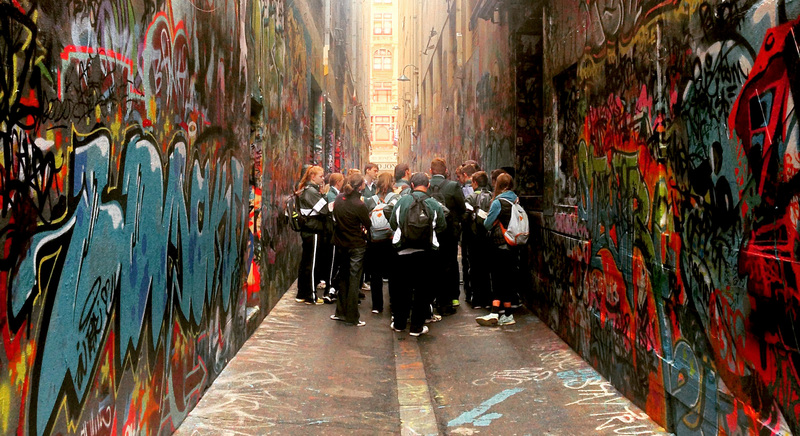 Apparently they have a program organised with 3/4 of all Victorian schools to do these exposure tours where the kids are invited to examine their own biases and stereotypes to do with homelessness. Learning things like that only 5% of all of the 25,000 homeless in Victoria actually live on the street but those 5% are truly lacking any support system beyond what is offered by government and groups like Urban Seed. Evan was pretty savvy to the thinking of this age group, engaged them effectively and had them all listening carefully by the end of the tour. Next up was the writing class where we met with a eclectic mix of folks who had been involved in a series of artistic classes with Brigitte, the partner of Evan. She had guided the group through painting and now was writing with photography next month. I was floored by the talent of the 3 older folks as they reeled off fine pieces of literature in our 5-minute timed assignments which reminded me that there are a wealth of stories to be told from people on the streets and in the community-at-large that often never get heard. 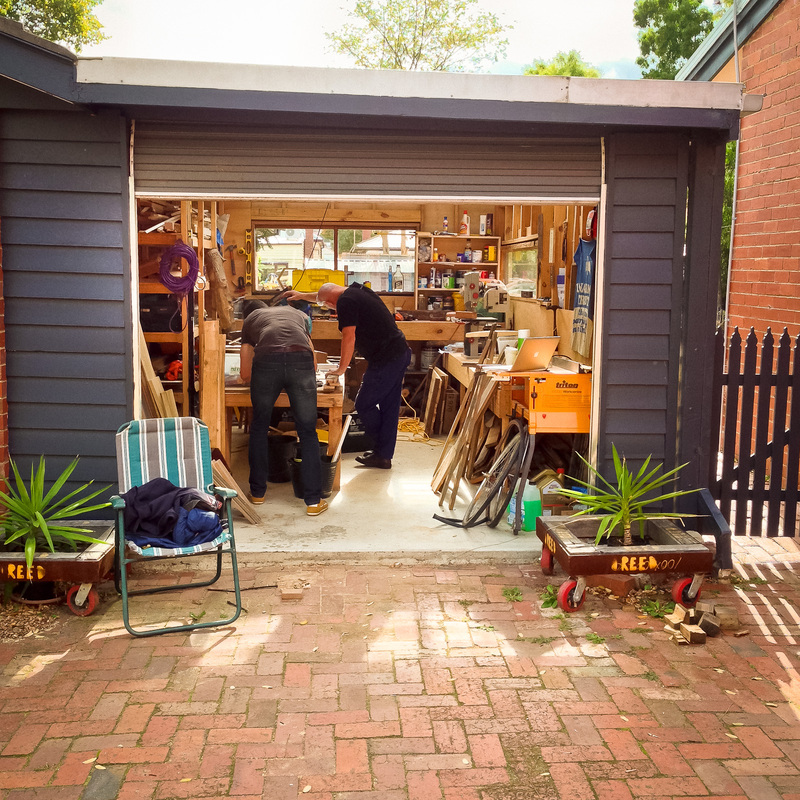 On the final morning, there was a Men’s Shed sort of activity where a suburban house and adjoining church hall had organised to have Urban Seeders come in to use a garage full of tools and timber to do wood-building projects. Jono (8th floor) and I took the train out to Ascot Vale and met Woodsy who was the only other person to come this week. 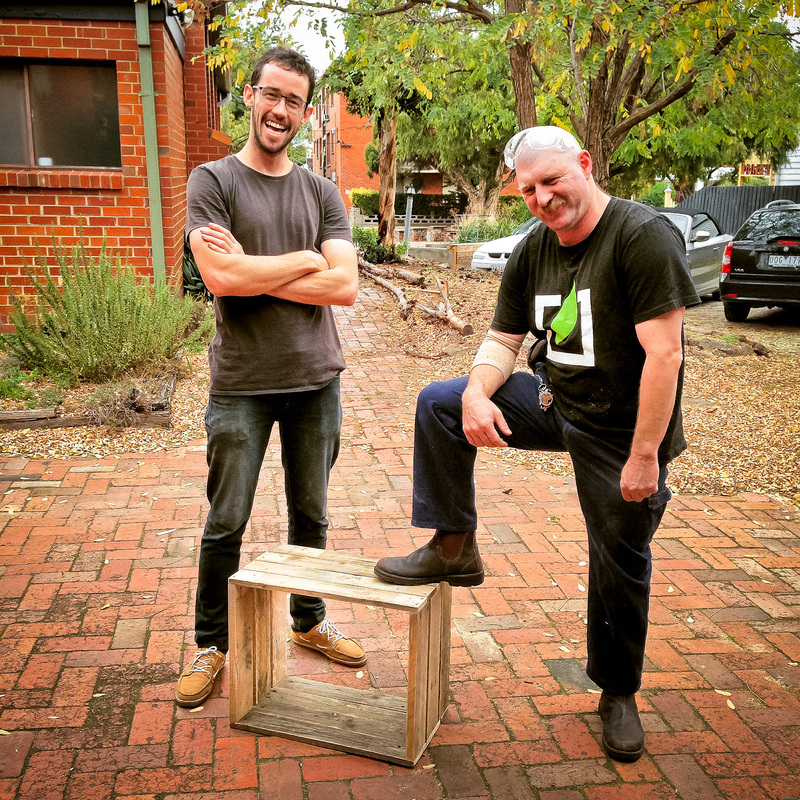 There was a mix-up with wood supply which resulted in Jono and I wandering the streets in search of a wood pallet, but luckily my pallet-sniffing senses were still keen from my Holden Hill days and I found us a nice one. We promptly put together a wood crate to be used as part of a table, and were wrapped by lunch. 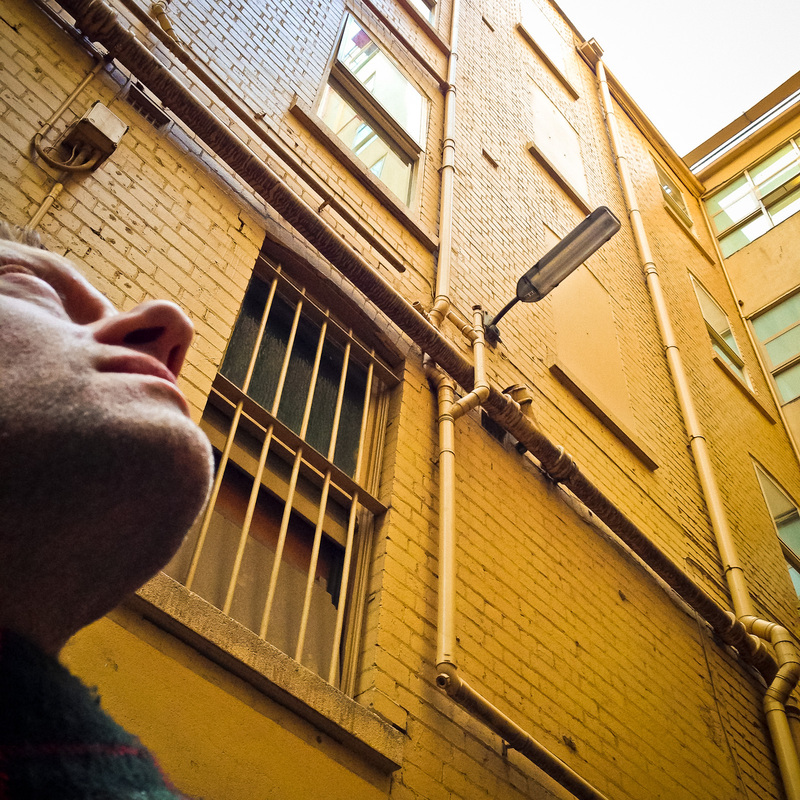 In such a brief stay we managed to experience a microcosm of life in the CBD which, on one hand, seems really inconsequential, but due to the richness of the people involved was surprisingly engaging and educational. I can only imagine what living here for weeks or months would be like (scared to think that I would likely not be cut out for it), but it would have to be something that you would remember the rest of your life. I can’t say that it’s my type of community dream, but I greatly admire the commitment, patience, resilience and devotion of the crew here as they do something very special in the name of their faith and humanity. Check out Heidi’s take on the visit to Urban Seed.